It's been awhile since I posted in this "behind the scenes" section of the blog, but my writing itch has reemerged, and I've had a flood of new post ideas. Since the main blog focuses on food- restaurants and products- I figured I'd veer off the beaten path a bit to explore areas beyond the restaurants and products I review on the main blog: travel, recipes, and other tips about how to make life a little more manageable while living with dietary restrictions. This post was born of my many trips to Washington D.C. in search of foodie finds. While I spend a lot of time eating in the District, I spend a fair amount of time playing tourist too, and want to share my favorite places in the city- which might not be the most popular ones in guide books, but are ones worth seeking out. Washington D.C. is such an incredible city, rich in history and culture, with endless things to see and do. From museums and galleries to national buildings where the United States is run on a daily basis, any itinerary can and should be jam-packed to make the most of your visit to the nation's Capitol. One Sentence Summary: The newest Smithsonian museum on the blog, the NMAAHC is the only museum in the nation dedicated to African American life, history, and culture. Highlight: The three, stacked history galleries tell a complex, nuanced story of African Americans in the United States from the infancy of the country to modern day. Don't Miss: The Culture Galleries, which showcases the stories and memorabilia from the worlds of art, theater, and music. Visitor Tip: NMAAHC is the only Smithsonian that you must have tickets for in advance; day-of entries are extremely limited. Tickets often have to be secured months in advance (more info). One Sentence Summary: The Kennedy Center is a 17-acre performing arts center located on the Potomac, with nightly performances of theater, music, opera, and ballet. Highlight: Even if you don't have a ticket, exploring the building is worth it in it of itself for the breathtaking views of the D.C. skyline and Potomac river. Don't Miss: Millennium Stage performances. They are free and open to the public, occur every day at 6pm, and feature arts groups from around the world. Visitor Tip: Get to the Kennedy Center from the Foggy Bottom metro station- they have free shuttles running every day. One Sentence Summary: Union Market is an urban market where you can shop 40 local vendors, most of them quick serve eateries. Highlight: My favorite gluten-free options at Union Market are DC Dosa and Arepa Zone. Visitor Tip: If possible, don't go on the weekends- it's usually way more crowded. One Sentence Summary: This century-old Cathedral is the sixth largest in the world. Highlight: The breathtaking Cathedral is notable for its cavernous architecture and stained glass windows. Don't Miss: In warmer months, the Rose Garden is a wonderful place to find serenity. Visitor Tip: Check their calendar to make sure the Cathedral is open for tours that day. They close occasionally for special events and services. One Sentence Summery: Located on historic Pennsylvania Ave, The Newseum showcases the evolution and role of the press and the First Amendment. Highlight: My favorite exhibits are the 9/11 one, the exhibit of Pulitzer Prize winning photos, and the First Amendment gallery. Don't Miss: The Greenspun Family Terrace, where you'll find the best photo op spot in the district with a breathtaking view of the Capitol. Visitor Tip: Check out their Events Page to see daily happenings- which sometimes feature people who make and write the news. One Sentence Summary: With bronze sculptures of the 32nd President and quotes from his oratory and writing, this monument on the tidal basin should not be overlooked. Highlight: The serenity of the tree-lined memorial is a great place for contemplation and reflection. Don't Miss: Eleanor Roosevelt's memorial, which recognizes her role as America's first delegate to the United Nations. Visitor Tip: While in the area, don't miss the Martin Luther King Jr. memorial a short walk away. One Sentence Summary: The Library of Congress is the national library of the United States and is a research center for Congress, and holds over 23 million volumes. Highlight: The beautiful rotunda and grandeur of the building rivals the more famous Capitol and White House. Don't Miss: Check out their Events Page to see upcoming exhibitions and concerts. Visitor Tip: Be prepared to undergo a thorough security screening because this is a Federal building. One Sentence Summary: This Smithsonian showcases the many faces of America, from politicians and celebrities to everyday Americans. 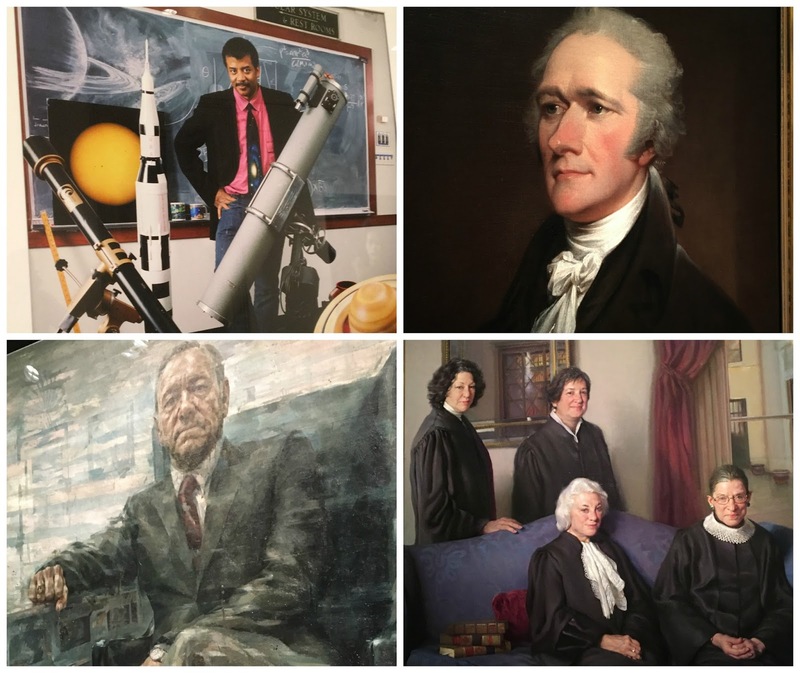 Highlight: The collection includes portraits of every US president. Don't Miss: The Gallery on the 1st Floor often displays topical exhibitions celebrating or honoring Americans whose portraits are in the museum. Visitor Tip: The building is also home to the National Art Gallery, so take time to explore both sides of the building. Is there a Washington D.C. hotspot you love that that I missed? Comment below and I might just add it to the list!